As lawmakers begin tackling how to handle implementation of the Affordable Care Act, it’s clear that Medicaid is once again at the center of the debate. How lawmakers will address the potential swelling of the Medicaid rolls and more importantly, cover those costs, have the providers impacted by those decisions watching with great interest. Medicaid is an important safety net for more than two-thirds of the 71,000 Floridians who depend on nursing homes for their daily care needs. Unfortunately, Medicaid rates for nursing home care have been reduced by close to $700 million over the past four years, with facilities losing $550,000 each year. This chronic underfunding for our state's most frail elders comes at a time when Florida is on the verge of a boom in the elderly population. While facilities remain committed to delivering residents the highest quality of care, they continue to struggle with a lack of adequate funding that affects their ability to operate effectively. But what can be done? Millions of seniors hold a potential solution in their hands if they own a life insurance policy. Legislation being considered this session will allow seniors to use the value of that policy to pay for needed long term care services, thus helping to reduce the pressure on Florida’s Medicaid budget when it comes to funding nursing home care. Life insurance is recognized as the owner’s personal property, with guaranteed rights to the policy as a “living benefit” and not just a death benefit. The problem is that far too many life insurance policies owned by seniors will never pay a death benefit because they are allowed to either expire, lapse or are surrendered for cash value. For seniors in need of Medicaid long term care services, life insurance is an “unqualified asset” for eligibility. As a result, they must either abandon or cash surrender their policy to qualify for coverage. But, converting a life insurance policy into a long term care benefit plan would extend their ability to remain private pay while the present day value of the life insurance asset is spent down in a Medicaid compliant fashion. All of this is done while preserving a portion of the death benefit for family members if their loved one passes. According to a recent study by Florida State University*, each year between 2,600 and 2,800 seniors who require long term care services have the potential to convert their life insurance policies into long-term health care benefit plans. Doing so would save the state and taxpayers between $79 and $93 million annually in Medicaid expenses. Seems like a simple solution, and one that will have a measureable, positive impact on Florida’s long term care funding challenges. We’re pleased that Representative Jimmy Patronis and Senator Jeff Brandes agree, as both have filed legislation in their respective chambers (HB 535/SB 794) which would give seniors this option. Stable funding is critically important to long term care in Florida, which is growing in both projected numbers and importance. Close to 10,000 people will turn 65 each day over the next 18 years. Over the next 10 years, health care jobs will be among the country’s top occupational groups. To meet those demands, nursing homes will need resources to recruit qualified nurses, Certified Nursing Assistants and other staff who are key to maintaining resident high quality care. We understand the Legislature is trying to strike a balance between funding critical programs such as health care and education while creating jobs that will strengthen our state’s economy. This legislation is a solution and a win-win for all those involved. Families have a means to pay for long term care, which is particularly helpful to the vast majority of those who have not planned for it with savings. The state gains an alternative funding source, reducing pressure on the growing Medicaid budget. And Florida’s long term care sector remains strong, giving nursing homes the ability to maintain a stable workforce and deliver high-quality care to those who need it most. In a 7-0 decision today, the Florida Supreme Court held that an arbitration agreement executed by the resident is binding on the estate/heirs of the decedent/resident. The question presented was whether an arbitration provision in an otherwise valid contract binds the signing party’s estate and heirs in a subsequent wrongful death case. In its unanimous decision, Justices found that arbitration agreements should be followed in such wrongful-death cases, upholding a decision by the 5th District Court of Appeal. "Because the signing party’s estate and heirs are bound by defenses that could be raised in a personal injury suit brought by the decedent, as well as by releases signed by the decedent, it would be anomalous to conclude that they are not also bound by a choice of forum agreement signed by the decedent in a wrongful death action arising out of the treatment and care of the decedent." FHCA strongly supports the use of arbitration agreements as a reasonable, intelligent option for patients, residents, and providers seeking more timely and less adversarial resolution of legal disputes. In addition, arbitration ensures that scarce health care resources go toward delivering resident care rather than the escalating costs associated with lawsuits. Over 60 percent of nursing home residents rely on Medicaid as their safety net to cover their long term health care needs. Today, facilities are losing an average of $22.81 per patient per day (nearly $550,000 annually) due to chronic Medicaid underfunding. Lengthy, costly litigation adds to the chronic funding challenges already facing the long term care sector and drives up costs for residents, facilities and ultimately taxpayers. Florida Health Care Association recently kicked off a staff fundraiser to raise money for and awareness about heart disease in women. The “Casual for a Cause” program gives staff the opportunity to make a charitable contribution and dress-down on Fridays whenever the Legislature is convened (committee weeks and session). The fundraising program is one that hits close to home for the Association. Last year, the daughter of FHCA Government Affairs Support Coordinator Teresa Hamlin passed away at the young age of 29. FHCA’s Casual for a Cause program honors the memory of Ramsey Brown, who worked as a legislative coordinator in Tallahassee. Ramsey was a vibrant spirit and will always be remembered for her passion for life. In February (Heart Month), FHCA Senior Vice President Joe Mitchell (right) and Executive Director Emmett Reed joined Teresa Hamlin (right) to present a $500 check to the founders of Broken Hearts of Florida, Karen Chavez and Kim Rooks (pictured from left to right). 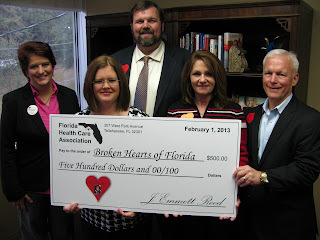 Ramsey and Teresa were involved with the Tallahassee-based non-profit which supports, educates and connects families affected by congenital heart defects and other pediatric heart diseases. “Life is precious, and FHCA is so pleased to be able to give back to an organization that recognizes that and does incredible work for local families,” said Emmett Reed.